Lots of people have told me that beagles love food. 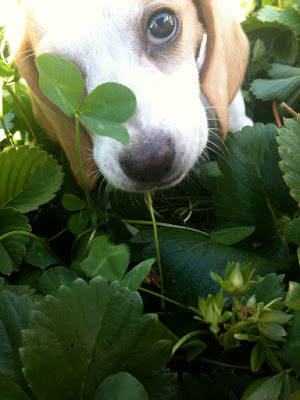 Well, um, Mabel loves strawberries. I found her today actually chomping on them in the strawberry patch. Racing Hugo to find the ripe ones. I can say that she's fitting in very well with this family. We just got got a beagle mix (Coco) and we had to make a new enclosed compost bin. I haven't started planting my garden yet, but it sounds like we'll need a fence this year. cute puppy eyes...I'm sure she is a very adorable addition to the family. Oh my goodness that is so super cute!! I'm getting all barky (dog version of clucky)... Love that she loves strawberries. very cute dog michelle, we get our puppy today I'm very excited! I hope she is a discerning eater too! We had a beagle growing up. I can remember my Mum being perplexed that we always had lots of green strawberries but never any red ones. Until she found him camando-ing on his belly (under the netting) along the rows eating the ripe ones! What a sweetheart. My girls and I saw the fantastic mr fox (it was fantastic) a little while ago and in the film beagles were shown as loving blue berries. My daughter has asked for a beagle and I have wondered as a hunting dog if they can live with cats. So sweet - how did I miss her arrival? Molly also lives strawberries and most of our crop!